I’m an anglophile – I love all things British. I watch BBC television, have a subscription to Britain magazine, and keep up with what’s happening in the British Isles through any number of means. 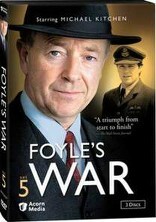 I love crime fiction, and my favorite show is Foyle’s War. It combines my interest in WWII, England, and mysteries. For those of you who aren’t familiar with it, let me give you the premise. Christopher Foyle is a veteran of The Great War and a Detective Chief Inspector on the south coast in the village of Hastings. Widowed, he has one son to whom he is very close. Their relationship is evidenced by dialogue and exchanged glances rather than demonstrated with hugs or physical contact. Foyle would rather be making a direct impact on the war by serving with the War Office in some way, but unfortunately, his requests for transfer are always turned down. Although a police procedural, the show is anything but dry. Each episode intertwines a crime, a home front issue, and personal situations of the characters, and I was disappointed when the show ceased production. In March 2015, I was visited Hastings. It was very exciting to follow in DCI Foyle’s footsteps.